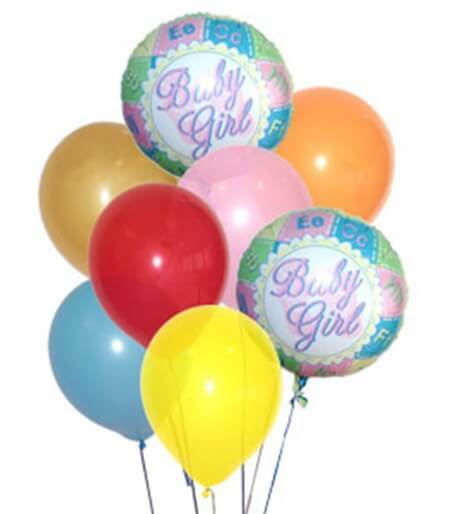 Festive balloon bouquet consisting of 6 latex balloons and 2 mylar Baby Girl balloons. Balloon types may vary. The Touch of Sympathy Casket Spray is a sweet and elegant arrangement to honor a life taken too soon. Pale pink roses and pink mini carnations are offset by baby's breath, ivy and lush greens to create a beautiful arrangement intended to bedeck the top of the casket. Accented with an ivory plush bear, a sheer white ribbon and a pink ribbon that reads, "Little Angel" in gold metallic lettering, this casket spray offers a lovely way to say your final farewell. 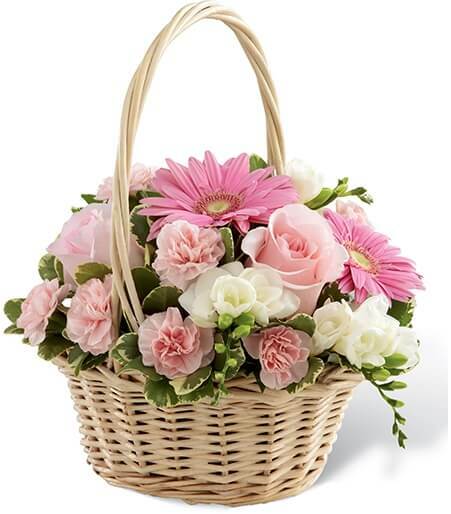 Your message of caring will be as clear as day when you send this pure white and pretty basket to the bereaved. A variety of beautiful white flowers such as roses, spray roses, alstroemeria, larkspur and more are lovingly arranged in this tribute. This glorious basket of beautiful blossoms will send hope and let those you care for know that grief is a path they needn't walk alone. 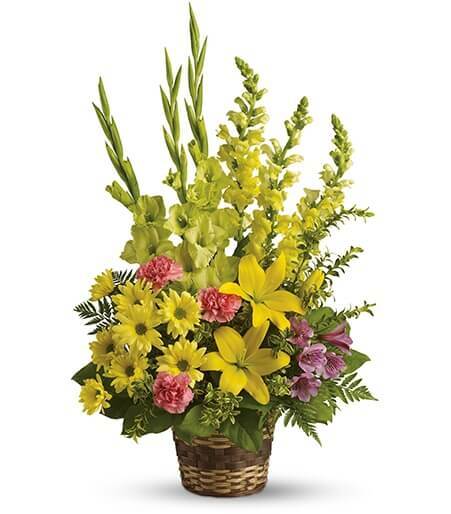 Bright flowers such as yellow asiatic lilies, snapdragons and daisy spray chrysanthemums along with green gladioli, purple alstroemeria and fresh greenery are beautifully delivered in a natural basket. There is nothing in the world as magical and precious as the birth of a new baby! 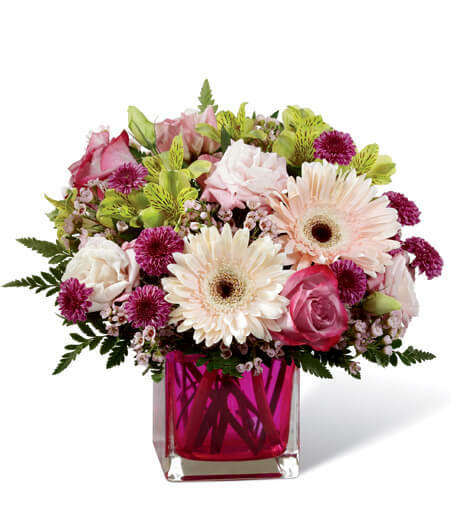 Celebrate the new little one with this beautifully blushing flower bouquet, bringing together pale pink gerbera daisies, lavender roses, pale pink double lisianthus, green Peruvian Lilies, clusters of pink waxflower, and burgundy button poms. 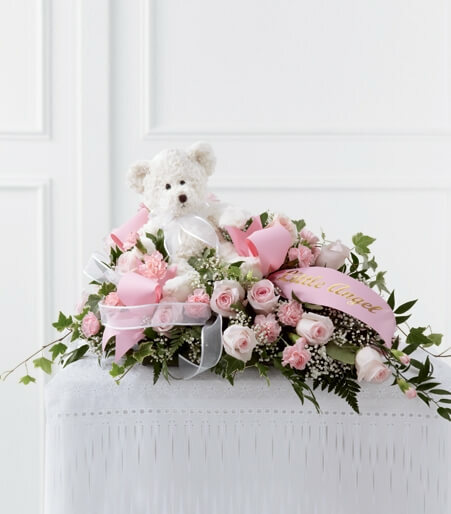 Accented with lush greens and arranged perfectly in a modern raspberry glass cubed vase, this flower bouquet is ready to welcome the brand new baby girl into the world, sending your sweetest wishes to the new family with this truly thoughtful gift. The Enduring Peace Basket is bursting with grace and sweet elegance to honor the life of the deceased and offer comfort to the friends and family suffering from their loss. 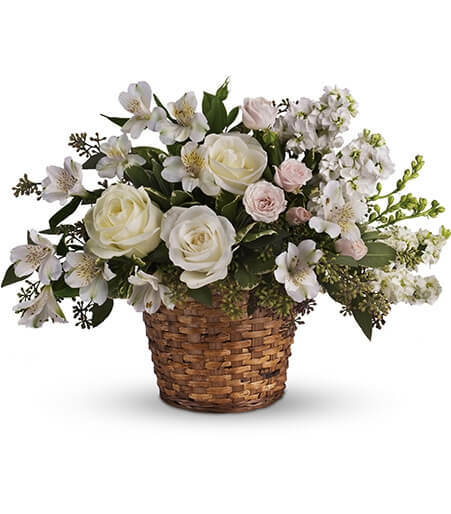 White freesia pop against a bed of pink gerbera daisies, roses and mini carnations, gorgeously accented with lush greens and arranged in a small oval whitewash willow basket, to create a beautiful way to convey your deepest sympathies. 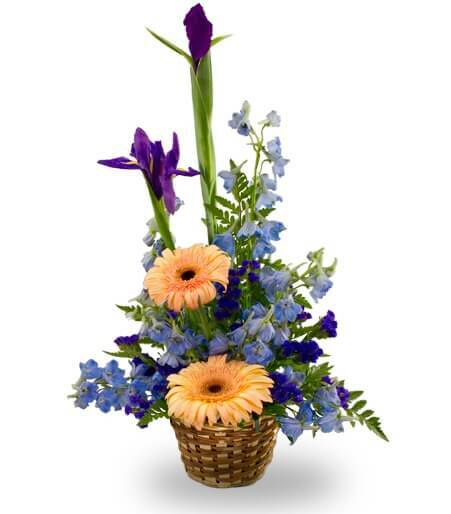 A basket of blue delphinium, blue iris and gerbera. 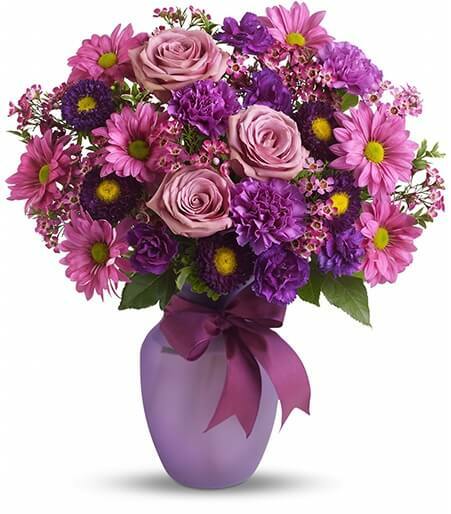 Flowers Across America makes it easy for you to send flowers to America from England. Your credit card company will automatically convert your purchase to GBP - we accept every kind of major credit card. England florists will charge you a large wire fee to transfer the order to an American florist - place your order directly with Flowers Across America and save money and time - start shopping below!